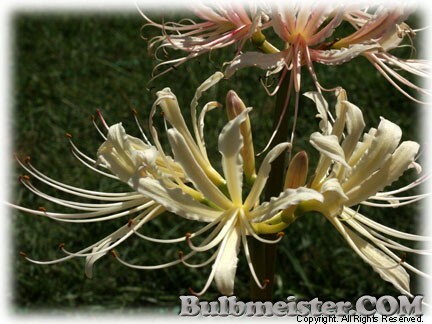 From the family, Amaryllidaceae, having common name(s) associated with the genus; Spider Lily, Surprise Lily, Hurricane Lily, Resurrection Lily, Magic Lily, Naked Ladies. This is a true L. houdyshelii, with strong stalks and rich, creamy white blooms that add streaks and shades of wine as they age. A winter foliage species. Ht. 30 inches. Hardy in zones 7, 8, 9, 10. Price Reduced, down from $29.95, 06/14/2017!